Interaction, dialogue, relations: these are keywords for any digital marketing activity. SMS marketing is now also unleashing its full power in interacting with recipients. 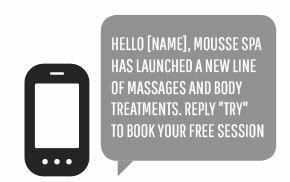 Inbound SMS marketing: what is it? Inbound SMS is the other side of SMS marketing that often remains sidelined in promotional campaigns, product launches and coupon offers: also called SMS-IN (for short), inbound SMS messages involve a response from their recipients. In other words, there is an exchange of text messages between the brand and its customers. In addition to the benefits of the SMS channel – with open rates above 98% – inbound SMS marketing is a key tool for brands to nurture their relationships with customers and prospects on a personal level, creating a dialogue to experiment with new forms of engagement and promotion. Why should you develop an inbound SMS marketing strategy? All you need is a mailing platform like MailUp, which lets you configure all activities and manage them easily from a single control panel. This lets you create customized keywords to be included in the SMS, use a personal response number or choose from a list of mnemonic SIM numbers (making them easier for the recipient to remember). Having said that, now let’s explain what you can do with inbound SMS: from collecting and managing contacts through to experimenting with new ways of engaging customers. Once the keywords have been chosen, MailUp will automatically synchronize each new contact to your pre-set list. Remember that marketing automation tools can be configured for each group of mailings to deliver personalized communications based on the profile and behavior of each recipient. As of January 2017, you’ll be able to combine triggered SMS mailings thanks to intuitive workflows and drag & drop operations. This is a great way to engage your recipients by offering them a potential advantage, nurture relationships and pave the way for later campaigns. Non-profit and crowdfunding organizations can rely on inbound SMS campaigns, which are scheduled for pre-set events or arising situations. 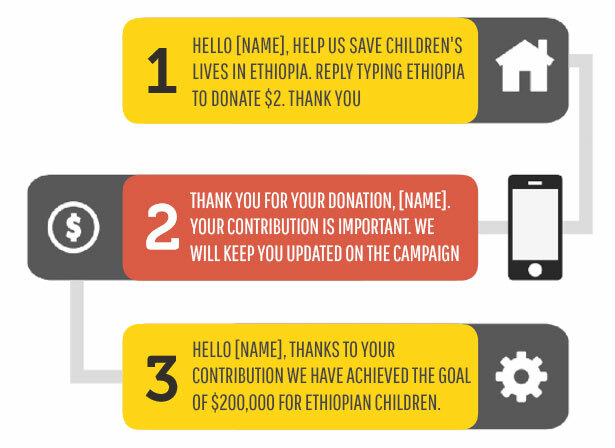 Invitations to donate via SMS are more immediate and effective than any other. Below is an example of a sequence based on a donation request: If the proponent responds positively by donating via SMS, another triggered “thank you” message is sent (preferably personalized). What’s more, by taking advantage of MailUp’s database filters, you can set up follow-up campaigns exclusively for the donor segment. The organization can then inform recipients of project developments or outcomes after a certain time period or when a particular event occurs (e.g. when the fundraising target is reached, when a conflict is resolved or when a prisoner is released). 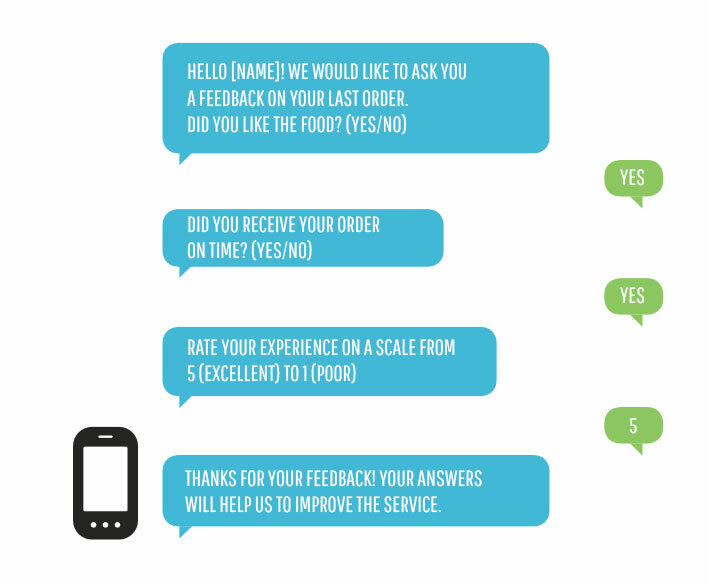 With SMS, you can invite your recipients to answer some questions to help you profile your database, or ask for feedback from users who have just completed an order about their purchase experience. It is often the case that those who receive an SMS do not feel comfortable with answering a call to action: this is why you should always guide recipients with clear, pre-set answers. While surveys are useful tools for improving the customer experience and being seen as supporting the customer (without being intrusive), profiling campaigns are key tools for collecting more accurate information on your contacts, developing increasingly thorough segmentations, and sending relevant and personalized campaigns. The limit of 160 characters is not so much a restriction as an opportunity to be concise and impactful. The size of the message, if used properly, will significantly boost its effectiveness. With the right tools, familiarity and a good dose of inventiveness, inbound SMS lets you experiment with new promotion techniques. Starbucks, like many others, has long been engaging their contacts with SMS, taking advantage of calls to action: one of its latest campaigns, at the launch of a new product, encouraged people to take part in a short quiz which, if solved, would cause a coupon to be automatically sent. And if 160 characters are not enough for you, MailUp lets you link three SMS into one, and include up to 470 characters for your text. You can also create a landing page with the built-in editor on the platform, and enter the short URL in the body of your SMS: your recipients just need to tap on the message to access a page optimized for mobile devices. Even more so than emails, SMS messages are able to create a direct channel between the recipient and the brand’s offer, which might otherwise get lost in their inbox. This is why many brands use the potential of SMS as a cross-channel bridge of communication, which starts with SMS and continues via email. The classic example is signing up to a loyalty program: SMS messages start by gathering registrations, while email campaigns do the follow-up work, outlining the advantages, benefits and useful information about the loyalty program. With MailUp, you can activate an inbound SMS marketing service tailored to your specific needs, with the option to activate dedicated numbers and create customized keywords to include in your SMS. Write to sales@mailup.com for more in-depth information on how inbound SMS can help your business.